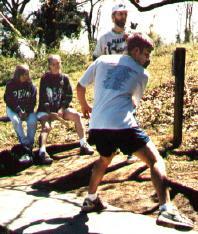 It’s played with discs – frisbees to uneducated, non-players. These aren’t your typical Whammo frisbees that we all grew up with, that college kids use to play Ultimate with. A little smaller and thicker, costing about $7 – 10 each. Most players have at least 3 or 4 – some for long distances, some that bend right or left, and a putter. 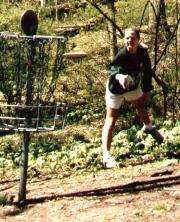 They play on disc golf courses, 9 or 18 holes. In this area, there are two, each located at area parks. 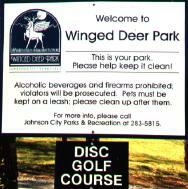 Warriors Path in Kingsport and Winged Deer in Johnson City. More Tennessee courses. It can be played year round, rain or snow. My husband and children are generally weanies and play when it’s not too cold. They don’t mind playing in a light rain, but prefer sunny. No wind is nice too. Tee off…. and aim for the basket. Find a course in your area.